Details: 2 BR, 2 BA beachfront condo, 1025+/- s.f..
Destin Florida beachfront condo for sale at Holiday Isle. This picture-perfect 2 bedroom beachfront 5th floor condo has it all - including a stunning location on the gorgeous beaches of Holiday Isle. Incredible views from both the master suite and the living areas plus an extra guest bedroom to sleep more people comfortably.This condo has granite counter-tops in the kitchen, refinished cabinets, an upgraded walk-in shower, washer/dryer and more! Soak in the breeze, sun, and sunrises from your balcony with an unobstructed beachfront view. 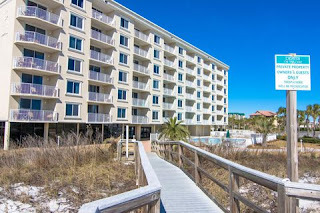 Destin on the Gulf is a premier location and offers a sparkling Gulf front pool for enjoyment. Don't miss out on this fantastic condominium! Destin, on the Florida Panhandle just east of the Fort Walton Beach, the semitropical Destin climate makes the area a popular tourist destination. Approximately 50" of rain is received in the area each year, combined with the Gulf of Mexico, high humidity is the norm during the summer. Thunderstorms are a frequent occurrence in the summertime, but they are generally brief with sunshine quickly returning. Winter, by comparison, is delightfully much cooler and drier, making for ideal conditions for enjoying outdoor activities.